B.R. Gelbaum、J.M.H. Olmstead,《分析学的反例》（Counterexamples in Analysis）, Holden Day Publisher (June 1964). Karl Weierstrass, Über continuirliche Functionen eines reellen Arguments, die für keinen Werth des letzeren einen bestimmten Differentialquotienten besitzen, Collected works; English translation: On continuous functions of a real argument that do not have a well-defined differential quotient, in: G.A. Edgar, Classics on Fractals, Addison-Wesley Publishing Company, 1993, 3-9. G.H. Hardy,《魏尔施特拉斯不可导函数》（Weierstrass's nondifferentiable function）, Trans. Amer. Math. Soc., 17(1916), 301-325. K. Falconer,《分形的几何》（The Geometry of Fractal Sets）, Oxford (1984). Johan Thim. Continuous Nowhere Differentiable Functions. Master Thesis Lulea Univ of Technology 2003. [28 July 2006]. ^ André Brouty. Les fonctions continues sans dérivées. ^ Denis Nicoletti. 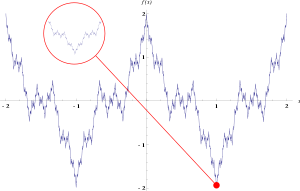 Properties of the Weierstrass Function in the Time and Frequency Domains (PDF). ^ Cette plaie lamentable. UJF Grenoble, 2007.